Despite a number of last minute withdrawals a full coach made the journey to Brecon for the 3rd Gwent League meeting of the season. On a bright, cold, but thankfully dry day in the shadows of the Brecon Beacons, a total of 39 athletes made it another memorable day for North Somerset AC. First up were the U11 Boys led by newcomer Harrison Garland, who despite leading the field for two thirds of the race, had to settle for a still very promising 7th place after taking a very heavy fall in the later stages. Backing him up were bottom age group Guy Owen who finished in a solid 24th place and Louie Brunsden, who finished 34th for his best placing to date. The U11 Girls were lying in 2nd place in the Team competition going into this race and six girls lined up at the start determined to close the gap on league leaders and local rivals from Westbury Harriers. Up with the leading group from the start, Charlotte Sidwell brought the team home in 8th position. She was closely followed by Alice Bridger-Morales, who recorded her highest placing to date in 13th place and Connie Ballentine in 16th. 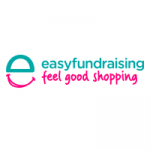 Strong support was provided by Ruby Owen in 35th place with Stephanie Brooks and Matilda Ballentine who finished in their bests positions to date, 39th and 49th respectively. The U13 Boys were lying a close up 3rd in the Team competition going into this race, and first home in 3rd place was fit again Sam Gentry who ran with the leaders throughout the race. Superb packing saw the next three athletes all finish in the top 20. Alex Collings in 16th, Ollie Lock, 17th and Jamie Carroll in 19th place with a real breakthrough performance, should ensure the team remains in the medal positions. Providing great backup in his first Gwent League race, Tom Phipps finished 32nd and not to be outdone Ryan Burton recorded his best finish to date in 50th position. The action continued with the U13 Girls race and Rosie Whitehead, the league leader after the first two races, was in the front three throughout. After a long battle with a Swansea athlete Rosie finished a very creditable 3rd place, which should be enough to maintain her leading position. Superb support was provided by her team mates with Nelly Bridger-Morales in 19th (making it a family double with another breakthrough performance), Maisie Squire 33rd, Isobel Gall 46th, Madeleine Soper 59th, Kerrin Smith 60th, Ellie Maule 70th, Ruby Soper 71st, and Lauren Smith 76th all recording their best finishes of the season to date. With leading U15 Boy Matt Hogg still missing through injury, five of the U15 Boys rose to the occasion with a season’s best performance from all of them. Leading the team home in 13th position, Jaylan Bacon finished the width of a vest in front of Callum Smith who recorded his first top 20 finish with a 14th place. Close behind and packing well together were Adam Major 17th, Luca Murray 24th and Jack Major 34th which should ensure the team remain in the medal positions. Sam Cocker, after starting very promisingly, sadly pulled up with a hamstring tear midway through the race. It was a depleted U15 Girls team that lined up at the start. However, short of regulars Lauren Ashurst and Sara Flower, good strength in depth exists in this group and they were determined to remain in top spot for the team competition. 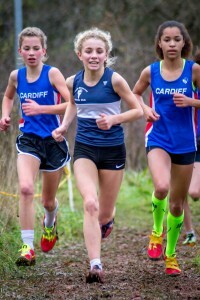 Individual League leader Alice Davies led the field from the off, but right on her shoulder throughout were two Cardiff athletes who had just piped her at the British Cross Challenge in Liverpool the previous week. Despite constant pressure from the duo working together, Davies showed her strength and class to pull away in the final 200 meters and recorded an outstanding race victory. Harriet Emery and Olivia Burton competed with the leading group throughout and a fine sprint finish from the pair up the home straight took them past rival athletes to finish in 11th and 12th respectively. Ever improving Lizzie Plews ran in her usual determined fashion to complete the team scoring in 24th place, which may just be enough keep the girl’s top of the leader board. In the combined U17/U20 race the U17 Boys team were missing Mike Proffitt to illness, but Joe Gentry and a resurgent David Warnes had their best races of the season to finish 5th and 6th respectively. With both lads being first year U17’s, these were tremendous results. 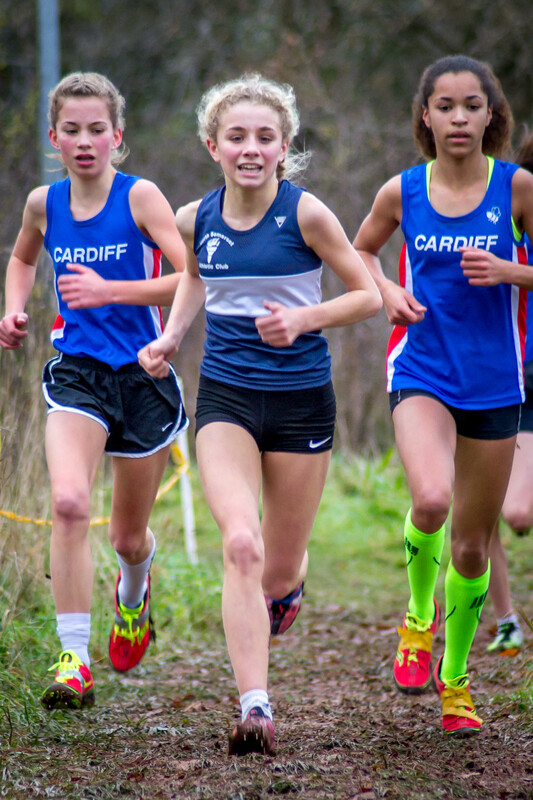 Not to be outdone, Alys Withers made her seasonal debut in the Gwent League and as another first year U17 she finished an extremely creditable 4th position in the combined U17/U20 Girls race.  Finally, in increasingly muddy conditions and with the temperature falling, James Rodgers, despite being thrown from his stride when taking a tumble, finished in a fine 9th place to round off a successful and enjoyable day for North Somerset AC athletes. We await publication of the full results to confirm team positions but after 3 meetings the club is in a strong position overall going into the New Year.